Our organization, along with the undersigned organizations and individuals, are happy to learn that as a result of the new chapter of relations with the international community, your government was able to approve the release of a number of prisoners of conscience, including The Washington Post reporter Jason Rezaian. Building on this very positive action, we ask your excellency to start a conversation with the Judiciary to free cartoonist Atena Faraghdani who is now in prison for publishing on the Internet a symbolic cartoon. Atena has been sentenced to 12 years 9 months in prison, awaiting final verdict for the court of appeal. Your excellency, you have pledged “support for the Freedom of Speech in Iran’s newspapers, magazines and websites,” and Foreign Minister Zarif also noted during a TV interview that “We do not jail people for their opinions.” Many Human Rights organizations and the UN believe that arresting, charging and sentencing Atena Farghadani for such activities contravenes the above-mentioned rights. It is also of concern to the international community that her continued imprisonment contravenes the spirit of a new era of international co-operation with Iran. The United Nations, and other World Human Rights organizations, consider Atena Farghadani to be a prisoner of conscience, presently held for the peaceful exercise of her rights to freedom of expression and association. 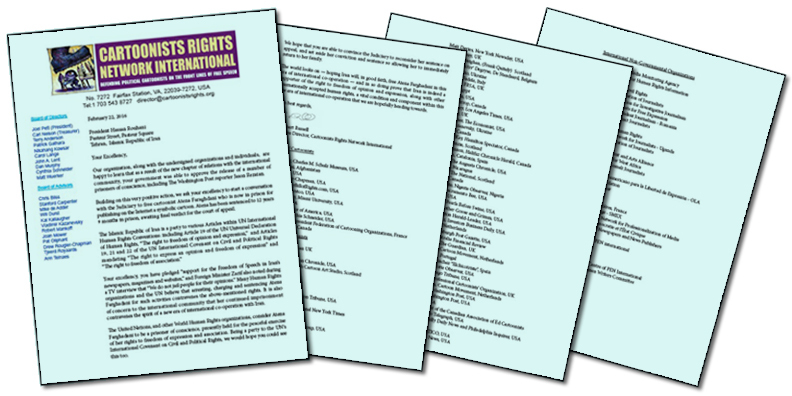 Being a party to the UN’s International Covenant on Civil and Political Rights, we would hope you could see this too. We hope that you are able to convince the Judiciary to reconsider her sentence on appeal, and set aside her conviction and sentence so allowing her to immediately return to her family. The world looks on — hoping Iran will, in good faith, free Atena Farghadani in this era of international co-operation — and in so doing prove that Iran is indeed a supporter of the right to freedom of opinion and expression, along with other internationally accepted human rights, a vital condition and component within this new era of international co-operation that we are hopefully heading towards.